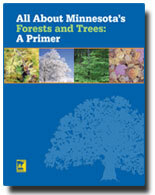 Download a complete book ( 58 pages, 8–1/2" x 11") or contact the DNR Information Center to request a copy. This book is written for those of us who care about trees and forests and who want to share our knowledge with others. With a little motivation, each one of us can teach about trees, care for trees, and establish a legacy of trees around our schools, homes, and communities. Please share what you learn with students, neighbors, community leaders, and others who care for trees and forests.